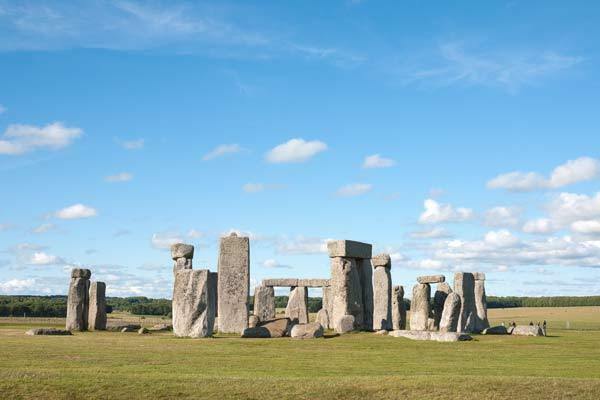 This is a tale about when Tamara and I visited Stonehenge some years ago. We spent some hours there in the afternoon. Then later that night or a couple of nights later (I forget which) we were driving along the main road near Stonehenge when we decided to take a detour and take a look at the standing stones at night. We had no idea whether we would be able to see much in the dark, but we were there – so why not? We drove along the small road that runs by Stonehenge and drove onto the grass verge opposite the site. I turned the car at an angle towards the field and hundreds of small, shining lights stared back at our headlights. Just for a moment, our hearts skipped a beat. The field was full of sheep and they had all looked up from munching away in the dark to take a look at us. Sheep have eyes like cats in that the back of the eye reflects light over and over again to help their night vision. So when our headlights beamed out at them, their eyes reflected the light back at us. Being just a few hundred feet from Stonehenge added to the effect of course. The shot of the sheep is so unusual! Well caught! I know that road so well and have been lucky enough to be on that side road in the middle of the night under a full moon. Just us and the security guard chasing us away! I love the sheep’s eye! 🙂 I have the same “caption” in one of my photos. Beautiful capture of this one! What a fab shot! Love the shape of the pupil and iris. Thanks for linking up, could you add the badge please so people know where to visit the other entries?